What are Social 2 Search Ads? Social 2 Search is the reason that you see various advertisements in your browsers. It is an ad-supported application that belongs to SuperWeb LLC. You may have heard of SuperWeb, because this company is infamous for releasing hundreds of similar programs including HypeNet, Girafarri, Browsestudio, DC Locknet, Faster Light, SaveOn, and many more. Social 2 Search has an official page with the same layout as most other sites of SuperWeb software. It does not provide a working download or that much information about the utility. It is clear that the adware is not a reliable application. You should get rid of Social 2 Search Ads as soon as possible. How does Social 2 Search work? As it has been mentioned above, Social 2 Search cannot be downloaded from its official page. This means that it gets distributed with the help of freeware and shareware. Free software can be acquired from such file-sharing sites as cnet.com, softonic.com, filewin.com, and others. It usually has potentially unwanted programs attached to it. These programs are presented in its installation wizard. If you miss them, you agree to additional offers automatically. Make sure that never happens again. Always choose Custom installation mode and deselect all components that are not essential to the installation. The main symptom of the adware is that it floods your browsers with commercials. It shows you ads on all sites that you visit, even if they have nothing to do with online shopping. These ads slow down your online surfing speed. Worse than that, however, they can lead you to corrupted pages. Not all advertisements presented to you by the program are trustworthy. You may be exposed to various virtual scams. We advise that you stay away from all commercial data until you eliminate Social 2 Search Ads from your browsers altogether. If you want to improve your online security level, you should not hesitate with Social 2 Search Ads removal. There are two options you can choose from when it comes to eliminating the adware. 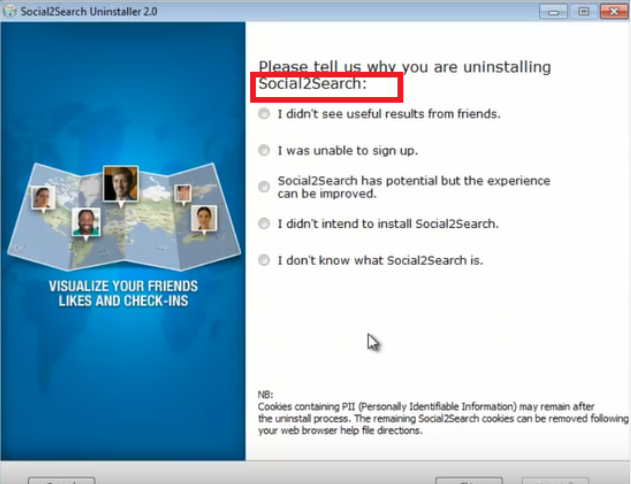 You can erase Social 2 Search Ads manually or automatically. If you choose the first option, you will have to uninstall the unwanted program from your computer via Control Panel. Alternatively, you can download the adware remover WiperSoft from our page and use it to delete Social 2 Search Ads automatically. This removal option is more beneficial, because it not only ensures that you terminate Social 2 Search Ads for good, but also that your get rid of other potential issues. Moreover, the security tool is also capable of keeping your PC protected in the future.